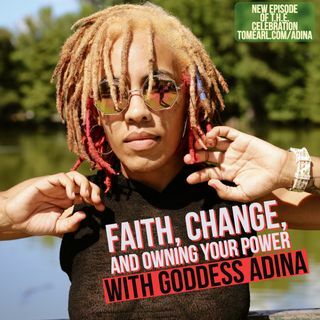 This week on THE Celebration, we interview Goddess Adina, whose mission is ‘to hold a space so sacred that all that enter it find themselves busting self wide open to see a whole new array of possibilities’. Goddess Adina is an Author, Performance Artist, Yoga Therapist and Healer. She was generous enough to share her thoughts on the difference between faith and religion, change being your only constant, and owning your power. Goddess Adina strongly believes this is the year and season of ... Maggiori informazioni owning your voice, truth, fears and insecurities; time to take all of that in, and stamp on it. Check out this vulnerable, open, self-reflective, baring-it-all kind of episode.